Gout in Back is my summary of spinal gout. So I answer the question “Can you get gout in your back?” Then I look at how common back gout is. Also, what you should do if you suspect gout in your back. I wrote Gout in Back for people who do not believe you can get gout in your back. Because gout sufferers often think they don’t have gout. Or, doctors misdiagnose unusual gout as some other disease. So, they do not accept they need uric acid treatment. Then untreated gout becomes a serious problem, needlessly reducing your quality of life. Also, untreated gout in the back will increase your chances of early death. If you are avoiding uric acid treatment, I call you a Gout Victim. So if you’re not sure what type of gout person you are, read Questions for Gout Sufferers first. In gout management, there is too much emphasis on short-term pain relief. Also, insufficient awareness of the consequences of allowing gout to reach the tophaceous stage. A single tophus often means severe joint movement restriction. This is quite common on the hands, where tophi restrict finger movement. But can these uric acid deposits spread to your back? The answer is “Yes”, as I found out in 2010. Then I used an image from that report in my first version of this article. Because the image shows how tophi in and around the spine have severely distorted the patient’s back. The report reveals that this impaired the ability to stand long enough to take a shower. 750 mg daily to achieve a target serum uric acid level less than 6.0 mg/dL. Usual pain from a gout attack. Discomfort from a distorted back. Pain from damaged spinal joints. 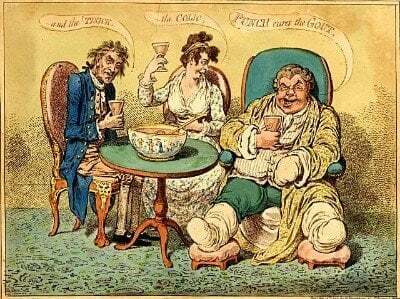 When I wrote earlier versions of this article, I thought gout in your back was uncommon. However, I subsequently found many more studies that imply gout in the back is more common than we think. Firstly, I found many more uric acid back pain studies[2-5]. But note that this is a small sample from my Google Gout Research tool. Also note, I included two references to gout in the neck (cervical spine)[6-7]. Because we often find it hard to tell if pain in the upper spine is related to the back or gout in the neck. Beyond that, I found many more uric acid back pain cases where gout was not diagnosed at first[7-11]. Because gout in the back mimics other diseases. So, it is logical to assume that thousands of other gout sufferers fail to get a clear diagnosis. Because spinal gout is often misdiagnosed. As well as tophi, uric acid can cause back pain in other ways. I have experienced it from bad posture caused by limping. Whenever I had gout in my feet or knees, I often walked awkwardly to try and limit the pain. This is a common cause of back pain. It isn’t exactly gout in the back, but the cause is the same. Excess uric acid should be treated long before gout affects your back. Another common cause of back pain is kidney stones. This is especially common with lower back pain. Again, early treatment is essential. Because uric acid can cause permanent damage and chronic kidney disease. Finally, untreated uric acid causes gout to spread to all parts of your body. So, gout sufferers often sleep awkwardly. Because the back is affected by most of our joint movements. Therefore many different posture problems from gout cause pain in the back. If you think your back pain might be uric acid related, what should you do next? It really is not worth letting gout go untreated this long. Are you showing any symptoms of tophaceous gout, or indeed gout symptoms of any kind, such as swollen joints? If so, you need to get your uric acid level checked by your doctor, and controlled today. If you are not sure what to say to your doctor, ask in the gout forum. You can also use the forum if you do not understand what your doctor tells you about gout in back. Leave Gout in Back to browse more Gout Symptoms. Samuels, Jonathan, Robert T. Keenan, Rena Yu, Michael H. Pillinger, and Tibor Bescke. “Erosive spinal tophus in a patient with gout and back pain.” Bull NYU Hosp Jt Dis 68, no. 2 (2010): 147-148. Uric Acid and Back Pain PDF. Vinstein, Arnold L., and Edward M. Cockerill. “Involvement of the spine in gout: a case report.” Radiology 103, no. 2 (1972): 311-312. Varga, John, Casimiro Giampaolo, and Don L. Goldenberg. “Tophaceous gout of the spine in a patient with no peripheral tophi: case report and review of the literature.” Arthritis & Rheumatology 28, no. 11 (1985): 1312-1315. Fenton, Paul, Stephanie Young, and Krystyna Prutis. “Gout of the spine. Two case reports and a review of the literature.” JBJS 77, no. 5 (1995): 767-771. Hsu, C-Y., T. T-F. Shih, K-M. Huang, P-Q. Chen, J-J. Sheu, and Y-W. Li. “Tophaceous gout of the spine: MR imaging features.” Clinical radiology 57, no. 10 (2002): 919-925. Cabot, Jonathan, Leigh Mosel, Andrew Kong, and Mike Hayward. “Tophaceous gout in the cervical spine.” Skeletal radiology 34, no. 12 (2005): 803-806. Duprez, Thierry P., Jacques Malghem, BC Vande Berg, Henri M. Noel, Everard A. Munting, and Baudouin E. Maldague. “Gout in the cervical spine: MR pattern mimicking diskovertebral infection.” American journal of neuroradiology 17, no. 1 (1996): 151-153. Bonaldi, Vincent M., Hoang Duong, Michael R. Starr, Laurent Sarazin, and John Richardson. “Tophaceous gout of the lumbar spine mimicking an epidural abscess: MR features.” American journal of neuroradiology 17, no. 10 (1996): 1949-1952. Barrett, Külli, Marc L. Miller, and James T. Wilson. “Tophaceous gout of the spine mimicking epidural infection: case report and review of the literature.” Neurosurgery 48, no. 5 (2001): 1170-1173. Yen, Pao-Sheng, Jui-Feng Lin, Shin-Yuan Chen, and Shinn-Zong Lin. “Tophaceous gout of the lumbar spine mimicking infectious spondylodiscitis and epidural abscess: MR imaging findings.” Journal of clinical neuroscience 12, no. 1 (2005): 44-46. Suk, Kyung-Soo, Ki-Tack Kim, Sang-Hun Lee, Sung-Woo Park, and Yong-Koo Park. “Tophaceous gout of the lumbar spine mimicking pyogenic discitis.” The Spine Journal 7, no. 1 (2007): 94-99. Lower back pain feels like a large lump at base of my spine and a lump on top of my spine. Also, I’ve got high levels of uric acid in my blood. I had both knees replaced due to osteo atheritis. And, my doctor says i have gout. But hands and feet ok – no pain. Thank you for your comment, Joanne. I think this page should give clearer guidance. People are often unsure if their back pain is caused by gout. Or, if it is due to a different form of arthritis. I’ve flagged this page for review. I hope people add their ideas about how to make this page better. Please add replies to Improving Uric Acid Back Pain Page. If anyone wants personal advice about uric acid and back pain, please start your new topic in the gout forum. You can use that same link to get personal help on any aspect of your gout. Is there a relationship between gout and costochondritis? I had a gout flare up 2 weeks ago that made me wonder if i had broken my foot. The flare up ceased and a week later I developed a stabbing pain like someone had stuck a knife through my back and it came through near my sternum. Ibuprofen seemed to help just a little, with the pain returning in force every 4 hours or so. Is there a possibility uric acid would cause this issue or is it just coincidence? Thank you for this forum and the opportunity to ask questions. I’m very pleased you like the forum. But, to get personal help, you have to ask in the gout forum. As you can see from Improving Uric Acid Back Pain Page, this page is now on my list of pages to review. I’m not planning to include costochondritis in my review. That’s because it’s just one of many back conditions that might get confused with gout. I don’t think there are enough people interested in costochondritis , to justify specific investigation. But, you might prove me wrong. Therefor, if you feel that I should research it more, please add your comments to the Improving Uric Acid Back Pain Page suggestion. Your comments will raise the profile of that suggestion. Then, I will raise Uric Acid Back Pain priority, and improve this page faster. The forum is for personal help for you. The feedback form is for general comments that I can use to improve these pages.